FLORHAM PARK, N.J. (AP) — Jeremy Bates likes what he’s seeing from Sam Darnold, even if the stats don’t necessarily stand out. The Jets offensive coordinator is tasked with developing a rookie quarterback while putting together an offense that can win games. It’s a delicate balance, especially when New York is 1-3 and Darnold is learning — and losing — on the job. With Darnold, it’s basic things such as taking a few more shots down the field with his throws and continuing to develop the confidence in himself and the playmakers around him. In a 21-17 loss at Cleveland on Sept. 20, the No. 3 overall pick mostly struggled while going 15 of 31 for 169 yards and two interceptions. 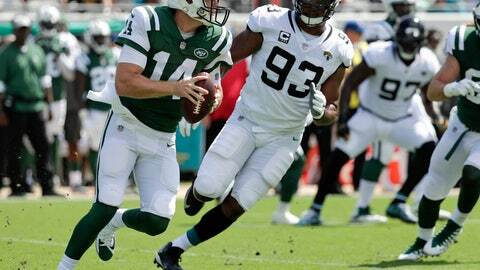 Darnold’s numbers weren’t much better in a 31-12 loss at Jacksonville last Sunday — 17 of 34 for 167 yards with one touchdown and no interceptions — but Bates saw progress. For the season, Darnold has had the typical ups and downs of a rookie finding his way in the NFL. He has four touchdown passes and five interceptions, and his 57.5 percent completion rate and 72.6 quarterback rating both rank near the bottom of the league. After putting up a 116.8 passer rating in Week 1, Darnold has a 53.8 rating in the three games since. The 21-year-old Darnold isn’t concerned about all that right now. He’s focused on getting better each week, and not letting frustration into his head. Among them are finding the right timing on routes by his receivers and building chemistry with them, so they can hit on some deep passes to keep defenses on their toes. Darnold has overthrown some of his receivers on some plays and missed open guys altogether at times — all part of the process for a young QB. Bates scripts the first 15 offensive plays for every game — “the old Bill Walsh (method),” the coach said — so that the players clearly understand the game plan for attacking the defense. It can be difficult, however, for an offense to get into a rhythm when they aren’t on the field much, as was the case in the first half against Jacksonville when New York had just seven plays in the first quarter and 22 the entire opening half. Again, lessons to build on for the future. New York’s offense ranks 29th overall, hardly looking like the world beaters that stunned the Lions 48-17 at Detroit in the season opener. The Jets’ running game has slowed considerably since that game, when they ran for 169 yards. New York is tied for 25th in the league in rushing offense, and 27th in passing. It’s easy to look directly at the quarterback’s production, but Bates says it’s too early to evaluate the overall job Darnold has done through just four games. “We’ll go back at the end of the season and re-watch all of the film, but we are encouraged by the way he is handling himself,” Bates said. “He’s owning each week as far as the game plan and he’s going out there ready to play on Sunday. He’s prepared and he’s looking forward to the moment and he’s playing competitive football. NOTES: WR Charone Peake (hamstring) and TE Neal Sterling didn’t practice, and Peake was already ruled out against Denver by coach Todd Bowles. … WR Quincy Enunwa (hip), CB Trumaine Johnson (quad), C Spencer Long (knee/finger), S Marcus Maye (ankle/foot) and CB Darryl Roberts (hamstring) were all limited. The injuries to Enunwa, Johnson and Roberts happened at practice Thursday. Bowles wouldn’t speculate on their availability for Sunday.